If you attend GCCA swap meets, perused our forum, or browsed the GCCA Classifieds, you've probably come across someone called "Wilpir". I was looking at the Classifieds a couple of weeks ago and came across an ad from Wilpir for Lithochromis xanthopetryx fry. This unusual Victorian cichlid isn't easy to find! I had three females that and I was looking for some males. I quickly sent off a note to Wilpir to ask if he had any extra males. He did! Wilpir's real name is Scott Reiser and he is an accomplished fishkeeper who lives in Oswego, IL. Oswego is well over fifty miles from my house, but I was driving down to Bloomington, IL for business and Oswego would conveniently be on the way back. Could I stop by? The American Cichlid Association (ACA) is a national organization dedicated to the cichlid hobby. The annual ACA Convention is a highlight of the year for many cichlid hobbyists. The ACA operates funds for cichlid research and habitat conservation. Both of these noble aims are fully supported by the GCCA and our club makes an annual contribution to the ACA. 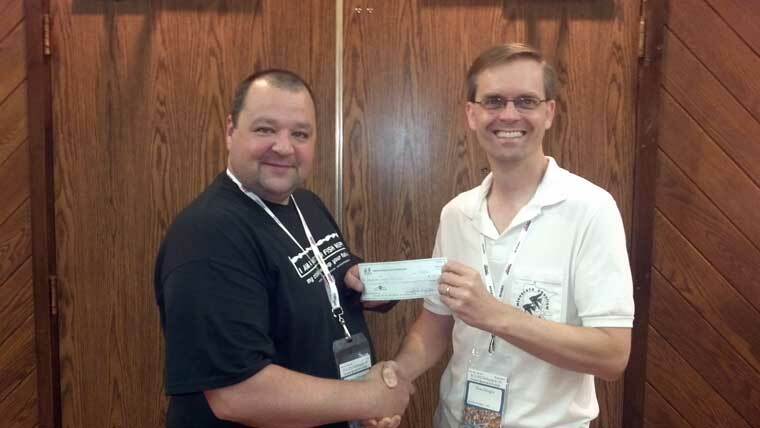 At the 2012 ACA Convention in Indianapolis, GCCA contributed $500 to the ACA. We are proud to support the ACA. GCCA Treasurer Bob Chirempes presents a $500 check to ACA Chairman Dean Hougen.